Obamacare is Here to Stay: Now What? If anyone ever doubted that elections have consequences, one only has to be reminded of what John Boehner said last week. “Obamacare is the law of the land,” the House Speaker told ABC News anchor Diane Sawyer, indicating that the Republican caucus will not attempt to repeal the Affordable Care Act (ACA). With the law’s future so uncertain until President Obama’s re-election on Tuesday, states are now left scrambling to meet key deadlines. By the end of the week states must decide whether or not to create their own insurance exchange (an online marketplace from which individuals and small businesses must purchase coverage) or leave its implementation to the federal government. States may also elect to participate in a partnership exchange with the government. 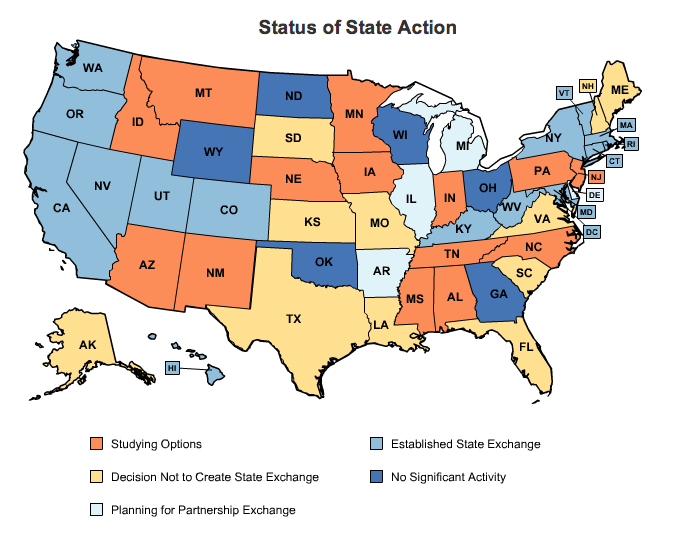 So far 13 states have decided to establish state run exchanges, but only two states, Massachusetts and Utah, currently have a functional exchange. In light of this reality, the Department of Health and Human Services (HHS) has extended the deadline for states to submit blueprints for their exchanges until December 14. States seeking a partnership exchange with the federal government now have until February 15, 2013 to outline their plans. This is problematic because exchanges were expected to begin enrollment just two months from now and be fully operational by January 1, 2014. HHS Secretary Kathleen Sebelius has said that states will still be able to meet this critical deadline, but given continued delays this seems to be a case of wishful thinking. And while the federal government is expected to establish exchanges in states that elect not to, the shape of the federal exchange is still highly uncertain. The Washington Post reported today that the sort of systems necessary to support such an exchange typically take between two to three years to build, making it highly unlikely that the federal exchange will be ready. Furthermore, the idea of federal exchange has met with resistance. In an effort to block the establishment of federal exchanges, Oklahoma Attorney General Scott Pruitt has filed a law suit that attempts to bar premium subsidies for such exchanges, which would effectively undermine the entire law. The ACA is designed to expand coverage by providing federal subsidies for the purchase of insurance to individuals with household incomes between 100 and 400 percent of the federal poverty level. The Oklahoma lawsuit argues that as the law is written, the subsidies are to be available only in the case of state run exchanges. If the lawsuit were to be decided in Oklahoma’s favor, it would become nearly impossible for the law to be sustained given the number of states that have already opted out of establishing their own exchanges. State based exchanges have also proven unpopular, as evidenced by Missouri voters’ decision to bar Governor Jay Nixon from establishing an exchange without legislative approval. Missouri’s legislature does not return to session until January, leaving the state little choice but to accept a federal exchange. At this critical juncture in the ACA’s implementation, it is clear that neither the Obama Administration nor many of the states are remotely equipped to meet the law’s requirements. Previous post ← What’s Left of What’s Right: New Conservatism and the Future of the G.O.P.